I haven't been here in a long while (probably since high school >.<) but I have been to their other location. My parents go here more on the days they spend together and they usually bring home left overs which I eat. I wanted to try something different and I was in the mood for seafood. 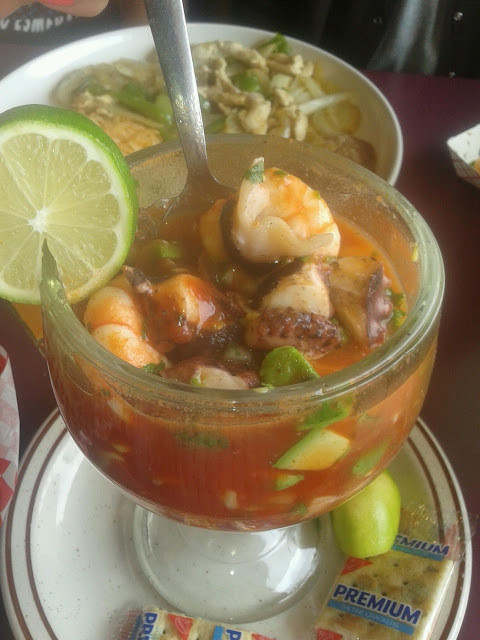 Therefore, I ordered this Campechana dish which is a Mexican seafood soup/cocktail dish that came with shrimp and octopus (my faves!) It was $12.99 and was a very generous portion of seafood. I loved the fresh onions and cilantro throughout and especially the avocado. It added a nice soft texture to the dish. I added extra lime to give it a nice tang. It wasn't spicy but it was flavor packed. It was exactly what I was craving without even knowing it. I of course ordered their Horchata (sweet and spiced rice milk drink) and it's always refreshing. It is a little sweet, but the ice dilutes it down later on. 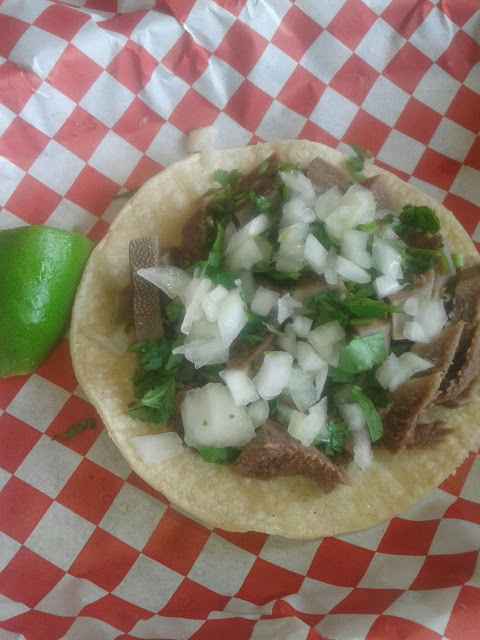 I didn't think the Campechana would fill me up (even though it did), so I ordered a Lengua (beef tongue) soft taco. The beef tongue was nicely cooked and was nice and tender, not chewey at all. A little flavorless on its own, but that's why you add your own salsa or pica de gallo to it. Simple and delicious. The single taco was around $3. Now this next dish we shared as a family. 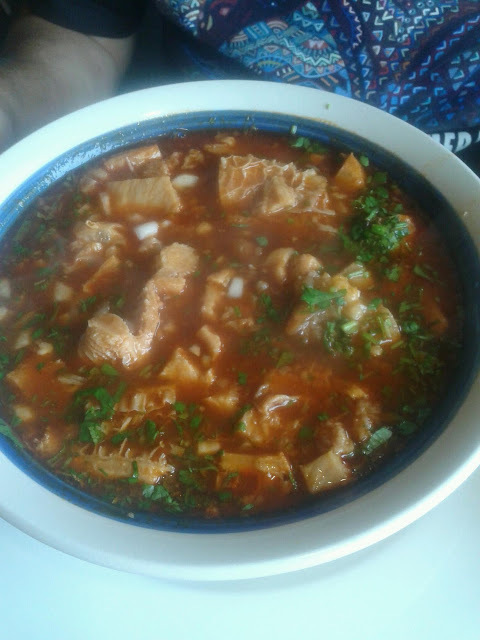 The waitress already asked my dad ahead of time if we wanted the Menudo which is a Mexican beef tripe soup. I guess my parent's are more regulars there than I thought. 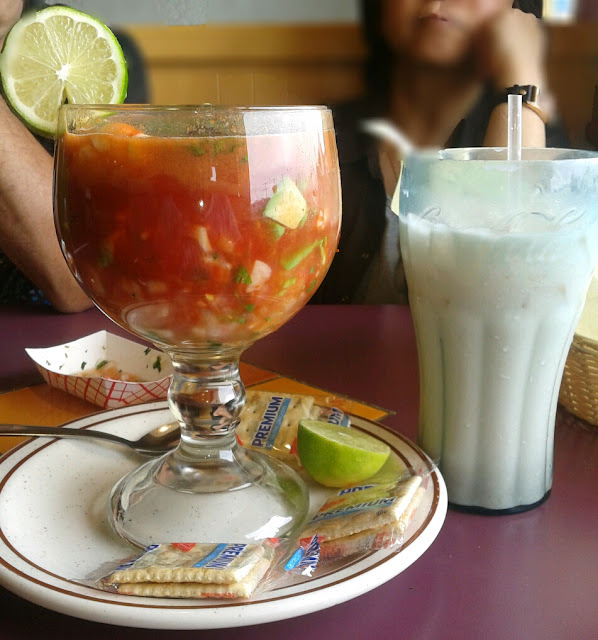 The Menudo is only made on the weekends so it is more of a "special treat." They make a rojo (red) version spiced with paprika (I believe) and other spices. It comes with a side of condiments such as dried oregano, cilantro and onions, and red pepper flakes. I personally think it tastes better with all the spices added. It gives a mouthful of flavor and also, if you don't like the smell of tripe, it masks it as well. The tripe was very soft and tender and overall, an excellent dish. I'm used to eating tripe and such prepared in an Asian way (Chinese dim sum, or in Vietnamese pho dishes) so having it prepared another way with different flavors is always a good experience for me. I highly recommend this place if you're craving good Mexican food. It's reasonably priced and offers delicious foods! The food was really good! I will definitely check out your blog!